Member of the European Parliament Guy Verhofstadt has launched a full-blown attack on Italy, having blasted the country’s prime minister, Giuseppe Conte, as a “puppet” after the latter said that the EU had “lost contact” with the people. Following Conte’s debut speech in Strasbourg, Verhofstadt, who is the chief Brexit negotiator for the European Parliament, asked him how much longer he was going to be “the puppet” of Italy’s Interior Minister Matteo Salvini and Deputy Prime Minister Luigi Di Maio. The two Italian politicians have recently found themselves at the epicentre of a diplomatic crisis with the French leadership. A year ago Di Maio claimed that the Five Star Movement was the Italian version of En Marche, now he support the #GiletsJaunes. Ridiculous! The Belgian MEP further claimed that once a “staunch defender of Europe”, Italy is now undermining the EU’s united approach to the political crisis in Venezuela and preventing the bloc from providing unanimous support for opposition figure Juan Guaido. “It's very painful for me to see such political degeneration”, he also tweeted. “I am not a puppet, I am very pleased to represent my people. The puppets are those who work for lobbies and other powers, and that’s not the case here”, Conte said. TWEET: “That some European bureaucrats, accomplices to the disaster of these years, dare to insult the Italian premier, government and people is really disgraceful”, he tweeted, urging voters to “send [MEPs] home” when the May European elections come. Verhofstadt’s criticism followed Conte’s keynote speech, in which he said that the EU had “lost contact” with the people and needed change to regain its “momentum”. The Italian prime minister addressed the need to control migration and manage EU borders, warning that "Europe cannot go on coping with migration on an emergency footing", because if it does so, "we will compromise the very fabric of a united Europe". "It is thanks to Italy that migration has been put front and centre of the European agenda", said Conte. He also confirmed that Macron held a phone conversation with his Italian counterpart, Sergio Mattarella, which was the first official contact between the two countries since France recalled its ambassador last week. Conte stressed that relations between the two countries were “solid” and could not be blighted by “single episodes”. The ill-tempered exchange comes amid a diplomatic rift between France and Italy: last week, Paris recalled its ambassador to Rome after Di Maio met with yellow vests leaders in France, which the French authorities slammed as an unacceptable “provocation”. “It’s not about being dramatic, it’s about saying playtime is over. A member of a foreign government who comes to France to support not even a political leader but someone who called for a civil war, who called for the overthrow of the president and a military government, this never happened before”, French Minister for European Affairs Nathalie Loiseau told Radio Classique last week. Shortly after that, Salvini emphasised that his government did not want to exacerbate tensions with France and suggested a meeting with Macron to mend what’s broken. “I don’t want to row with anyone, I’m prepared to go to Paris, even by foot, to discuss the many issues we have”. He, however, noted that Paris must first deal with three issues, such as stop pushing migrants from France back to Italy, halt lengthy border checks blocking traffic, and hand over some 15 Italian fugitive militants who are believed to have been hiding in France for decades. Relations between the two European Union member-states turned sour after Di Maio accused Paris of being responsible for the migrant crisis in Europe, saying that France was exploiting Africa and had never stopped colonising it, which has fuelled the refugee crisis. 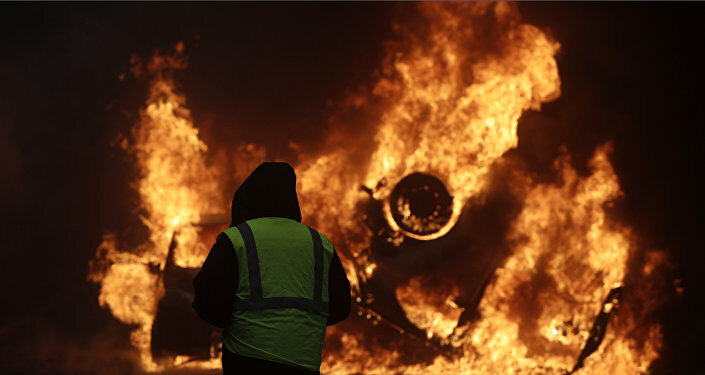 Salvini, for his part, slammed Macron as a “problem for French people”, while addressing the nationwide yellow vests protests, which kicked off as a demonstration against hikes in diesel prices in mid-November, but have since evolved in protests against government policies, with many demanding that Macron resign.